Learn about our committee structure B-R-E-A-K and how you can get involved. We encourage our members to get involved with a committee that interests them. "To provide and make available educational opportunities and resources for chamber members and their employees to enhance their quality of life through business and personal development and growth." "To grow the Chamber membership, act as Ambassadors of the Chamber and provide networking opportunities for Chamber members." Young Professionals meet on the 4th Thursday of the Month from 12:30pm-1pm. Visit our Young Professionals page for more information. 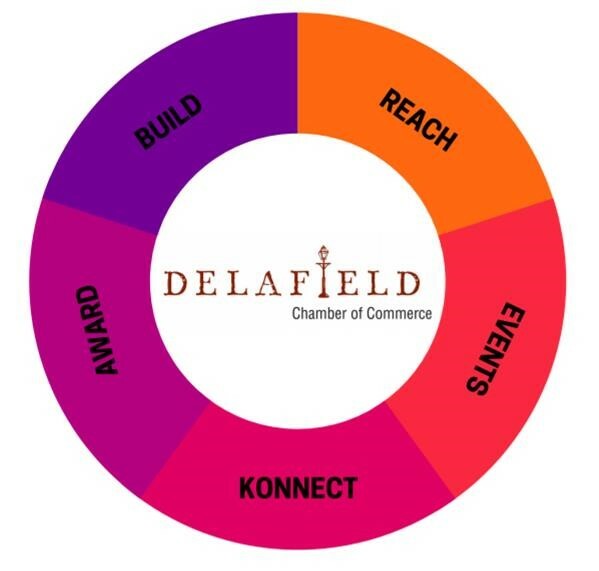 "The Delafield Chamber - Events Committee shall be comprised of chairpersons from each event sub-committee, and chamber member business owners or team members. The Events Committee shall be responsible for providing a strategic outline[WHAT], which each event sub-committee can utilize to determine [HOW] they will accomplish event goals. The strategic outline will include guidelines and priorities with regard to whether an event's purpose is to drive profitability, traffic (people), member promotion, or a combination thereof." Are you interested in the EVENTS Committee? "To identify excellence in achievement by member businesses and recognize those accomplishments through various communication channels available to the Chamber including social and traditional media as well as events. If you are aware of a recent outstanding accomplishment please let us know so we can share the news!" "To implement effective promotional communication and marketing between the Chamber and its members, tourism and the community and its partners."